The EU top diplomat Federica Mogherini, visited Tehran, Iran, to attend the formal inauguration ceremony of President Hassan Rouhani. Mogherini held bilateral meetings with President Hassan Rouhani, Foreign Minister Javad Zarif, the Foreign Policy Advisor of the Supreme Leader, Ali-Akbar Velayati, and attended a roundtable discussion at the Council for Foreign Policy headed by former Foreign Minister Kamal Kahrazi. In the bilateral meetings Mogherini acted in her capacity as coordinator of the Joint Commission of the Joint Comprehensive Plan of Action (JCPOA), discussed the state of implementation of the nuclear deal. She stated that the JCPOA is delivering on its objectives as confirmed by the six International Agency for Atomic Energy reports and by the economic results following the lifting of nuclear related economic and financial sanctions. The EU diplomat reiterated the EU’s unwavering commitment to the deal, recalled its historic significance, multilateral dimension and its importance for regional and global stability. Mogherini underlined the need for a full and effective implementation of the deal by all parties throughout its duration. 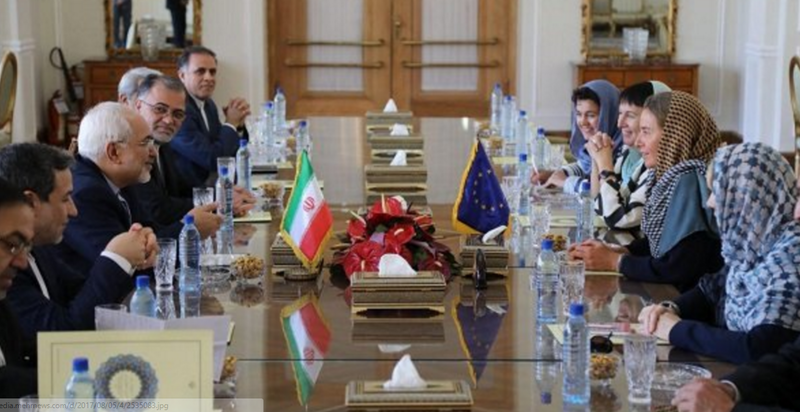 The EU diplomat reviewed the bilateral cooperation between EU and Iran on different areas. Both sides confirmed their interest in expanding this cooperation and discussions will continue at the next High Level Dialogue meeting. The Mogherini conferred with her interlocutors on the situation in the region, confirming the EU support for a regional mechanism of dialogue. The diplomat used the occasion the inauguration offered to discuss the need to urgently find a political solution to the conflict in Syria.